When a show runs as long as the likes of The Big Bang Theory, it's only natural to feel a degree of fatigue. And it's not even like the show is getting worse than when it started - but it does feel like it's mostly just coasting through and maintaining a particular beat. This is neither good nor bad, but the term stagnating starts to come to mind. What we are getting is a steady progression in terms of the lives of the characters and things generally just following the natural course of events. Characters are getting married. Fewer and fewer of them are not in relationships. Babies are just around the corner and all that good stuff. Things generally make sense and things are moving forward but they're also not taking too many risks with the narrative they're pursuing. It's decent, steady entertainment but I can only wonder how the actors feel about the show's direction. IS this going to end with everyone in nursing homes but still somehow geeky? 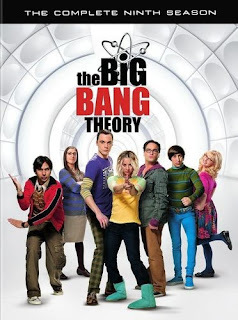 Synopsis: The Big Bang Theory is an Americani comedy television series created by Chuck Lorre and Bill Brady. As of the time of this review the show is confirmed to continue on until 2019 for a 12th season. The season begins with Leonard (Johnny Galecki) and Penny (Kelly Cuoco) finally eloping in Las Vegas with the rest of the gang left to possibly watch the live stream of the ceremony. In sharp contrast, Sheldon (Jim Parsons) manages to push Amy (Mayim Bialik) too far and she declares that they're breaking up in front of the rest of their friends. This is somewhat ironic as Sheldon had been holding on to his great-grandmother's wedding ring, implying that he had been preparing to propose to Amy. The nagging issue of the first part of the season is Penny now knowing that Leonard and Mandy had kissed a few years ago (as revealed at the end of season 8) and how this knowledge nags at her as she's in Leonard's place of work. And there's how the marriage is not well-known yet, especially with members of their respective families. Lastly there's Sheldon still hoping to get back with Amy but being too angry to make proper amends because that's who he is. What I Liked: The married dynamic of Leonard and Penny plus Sheldon quickly slips into an odd family dynamic. It had already been happening beforehand but this season really pushed things with Sheldon's initial concerns about them living apart to begin with down to the modified roommate agreement and the shared time between apartments. Sheldon eventually gets the most character growth and development this season given how he handles all the changes in his life and finds a way to step up to the plate. Plus yay for the Adam Nimoy cameo! The latter plot thread about the gang coming up with an idea for a new type of gyroscope does make for an interesting arc that mostly has them working together for a change. This even includes leveraging Sheldon's love for drafting contracts to find a way to ensure that any profits from the patent are shared equally with everyone in a fair manner. The man children are growing up. What Could Have Been Better: Raj (Kunal Nayyar) was in a weird place in this season as he's largely fallen into this weird supporting role where he's mostly whiny or oddly motherly? Howard (Simon Helberg) is already married to Bernadette (Melissa Rauch), so the old arc depicting them as a pseudo gay couple died several seasons ago and I feel like they never quite figured out what to do with him. And this season sort of drives that point home as he's practically on the same level of Stewart (Kevin Sussman) now as another quirky outsider. The same goes for Bernadette, who has really slipped into the background since the marriage apart from insunations that she's the replacement for Howard's mother. The news of the pregnancy pushes her further back and makes her more like a baby factory more than anything else. But those are the kicks with a cast this large. TL;DR: The ninth season of The Big Bang Theory felt like it was just coasting through without really trying and that rathed disappointed me. It's not yet an absolutely bad show, but it is getting a little tiring. Thus the season only gets 3 contracts that Sheldon has drafted this season out of a possible 5.